Tom, shy office clerk by day and drawer of foxes by night wakes up one Monday knowing the most extraordinary week of his life is about to begin. In five days time a lifelong ‘secret’ will be made gloriously public—but will it mean losing the person he loves most? It seems like only yesterday Tom changed nappies and sang nursery rhymes to a laughing baby. He relishes the demands of being a daddy; especially teaching his little girl to draw and paint as she grows up. But the years tick by and times change. Long-buried secrets must come to the surface which may test even the strongest ties. He writes a list of all the things he has to do before the weekend and sticks it in the middle of his wall. The names and goals hang like threads of a spider’s web, inevitably leading to the centre, and all to the same place. Each morning he notes the colours of dawn, listens to the birds and waits for the perfect moment. In one hand rests the balance of life and a terrible responsibility, in the other a wedding ring. Difficult days and the past loom, but his friends rally round and one by one the words come to life. Everyone waits as Tom finds the strength to open up and set free the secrets of his heart in a celebration of family, friendship and love. A quirky story of modern life, set within the breathtaking landscape of Bradford. Dear Mona Lisa... Was. Brilliant. In every way. It was a bit heavy, while still feeling whimsical, and I loved it. It's a story of letting go of the past so you can embrace the future. It's about coming out. It's about finally living life out loud. It's about finding home. Tom is an artist who draws whimsical animals doing fun things. Foxes, bunnies, birds. He uses his art to communicate his deepest wishes and he brings his art to life. Tom also makes lists. And he's got one very important list to get through before his wedding day. And it should be easy. It should be. But some things take time to work up the courage to do. And Loz is definitely the other half of Tom's heart. He's kind and patient and understanding and so so supportive of Tom's anxiety. Loz knows that Tom has to work through his fears in his own way and he was so wonderful. Tom broke my heart with his fears and the events of his past that shaped him. And Loz was exactly who Tom needed to feel whole. Every page, every feel, every moment, my heart broke a little more, until it was finally made whole again. I'm so happy that Tom and Loz found each other. I think that Dear Mona Lisa... is these authors finest work. I feel like I got a glimpse of their souls in these pages. And the ending was so damn perfect I shed a couple of very happy tears. 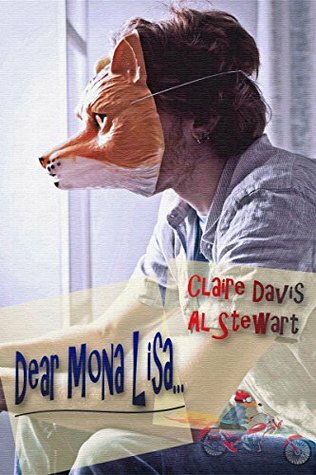 ARC of Dear Mona Lisa... was generously provided by the authors, in exchange for an honest review.